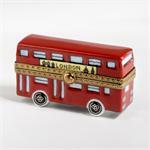 Limoges boxes have always been a treasured specialty at the Cottage Shop. Since 1985,when the first edition of our catalog was printed, we have enjoyed to travel the world to bring you the most unique gifts of high quality for the collector and for your gift giving occasions. At the moment, we are updating our site and we will delight you very soon with lots of brand new Limoges boxes, mostly created exclusively for us. Our Limited Edition Limoges boxes for 2013 are the highest quality and best Limoges boxes that are being hand painted in the city of Limoges today. 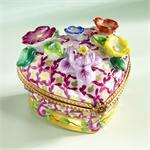 At The Cottage Shop , you will always find the best selection of French hand painted Limoges boxes at the best prices. Each Limoges box we create and are pleased to present to you is commissioned to the highest quality Limoges decorator painters in the city of Limoges, France. Brand new Limoges boxes have arrived at The Cottage Shop for you to enjoy and celebrate the New year 2015! 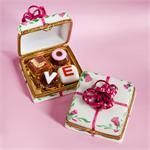 and make wonderful Limoges boxes gifts to your friends and family. Right on time for Valentine's Day, we bring you back our classic exclusive creation: our Limoges Red telephone from the 60s Box with a message in a little Limoges porcelain card: "I just called to say I Love You". 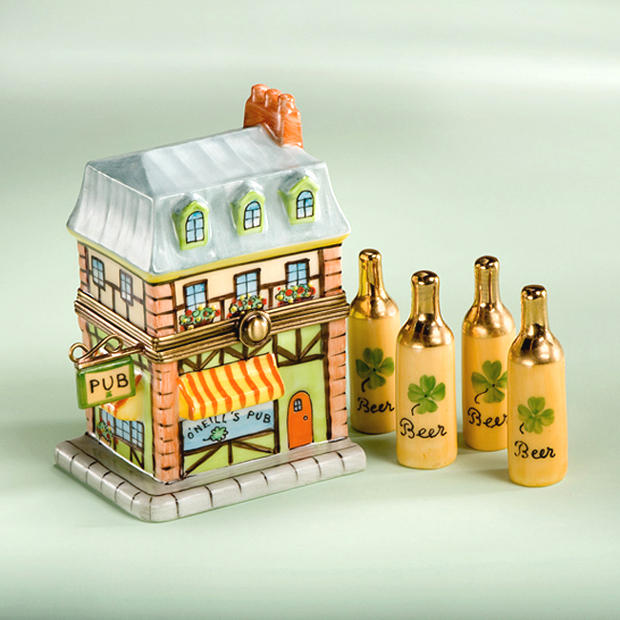 We think you may enjoy a visit to our brand new collection of Limoges Boxes found at Limoges Irish Corner Boxes where you will find an adorable Limoges Irish baby Lamb with a four leaf clover, a Limoges Green Irish Hat Box, a Limoges Irish Cup box, and a very special Limoges Irish Telephone box with an Irish Message on a little Limoges porcelain card. This year, you do not want to miss our very affordable Limoges heart boxes and our Limoges Valentine boxes collection for that little gift to your very special person. We want to say Happy Birthday America! with our Limoges USA Boxes. Please visit this Limoges box section and you will find our exclusive Limoges Historical Book Boxes from the First Presidents of our Great Country. Many new Limoges Boxes are being added to our Limoges Baby Boxes to make sure we have the perfect Limoges box for your gift occasion. You do not want to miss our Limoges Home Appliances Boxes, where you will find a Limoges refrigerator box with a removable drawer, a Limoges Grill Box, a Limoges Mixer Box, a Limoges Ironing board box and many more Limoges Boxes for the Home. Our Limoges Museum Collection Boxes has some magnificent artistic new Limoges boxes, our Limited Edition Limoges Boxes with a new Limoges 2014 Box to surprise you will be arriving this fall. We have added some Limoges Cupcake Boxes to our existing Limoges Exclusive Cupcake Box Collection to indulge you with sweet delights. At this time of the year, you may want to visit our Limoges Summer and Beach Boxes where you will find new Limoges Beach Boxes, Limoges Mermaid Boxes, Limoges Boxes with Palm Trees . Our Limoges USA Collection Boxes stands out with our exclusive historical presidential portraits books and postcards, the perfect gift for the history buff. If you want to remember your recent or not so recent travels, please visit our Limoges Travel Boxes Section , you will be taken to a tour in the world of the Limoges Boxes finding many Limoges Suitcase boxes or Limoges Shopping Bag boxes from places you visited as well as Limoges Postcard Boxes thinking of the old days, before the technological area, when we used to send postcards to our relatives and friends from our trips best loved cities. . Thinking a little ahead, a Limited Edition Exclusive Limoges Halloween Surprise box will be arriving at The Cottage Shop by the first days of October. It will add a very special touch to our Limoges Halloween Boxes Collection and we trust Our Limoges Halloween Collectors will be delighted with our creation. When we think Limoges Christmas or Holiday Boxes, one of the first things to come to our memory is the exquisite Limoges Chamart Twelve Days of Christmas Boxes . This Collection has been a memorable Limoges gift for years now. 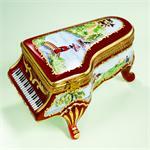 We are pleased to continue to present many Limoges Chamart Boxes in our websites. 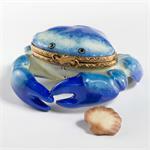 Limoges Christmas Boxes will also have new additions this fall and we are bring back our Limoges Christmas crab box, our Limoges Holiday Puppy on leaf box together with some magnificent Chamart Limoges Christmas Boxes. In a few weeks, we will be pleased to present our new site to you , with lots of brand new Limoges boxes for every occasion and gift giving you may have. 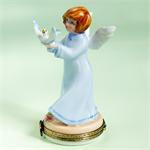 Our collection of De Carlini Italian glass ornaments will also be fabulous for the holiday season 2014! Many new styles and lots of limited editions have been carefully created and designed by us together with the Soffieria De Carlini as every year. New styles of the De Carlini Italian mouth blown glass ornaments have arrived for the best Christmas ornaments of your Christmas tree this year!. We invite you to visit our websites and call our store at 1-800-965-7467 1-800-965-7467 from 9.00 AM to 10.00 PM EST Monday through Friday and from 10.00 AM to 4.00 PM EST on weekends. We will be happy to assist you. With our best wishes for very healthy and prosperous New Year 2014!